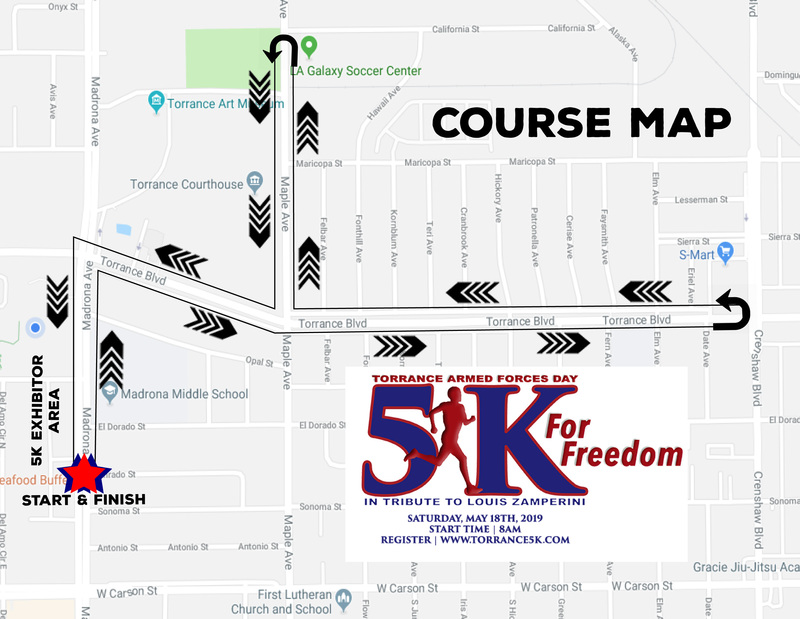 Join us for the 4th annual Torrance Armed Forces Day 5K for Freedom Run/ Walk, in tribute to Louis Zamperini, touring around beautiful Torrance, California on Saturday, May 18th at 8:00am! All finishing participants will receive a 5K for Freedom commemorative t-shirt. There will be chip timing and sponsor refreshments. Del Amo Fashion Center, on Madrona Ave.
WAIVER FORM: Entry without signed Waiver Form will be returned. This waiver contains limitation of your legal rights. Your Signature below means you and/or your parent/guardian has read it and agrees with the statement below: WAIVER: In consideration of my, and/or my dependent’s participation in the Torrance Armed Forces Day Run, I hereby release and hold harmless the City of Torrance, TACC, Del Amo Fashion Center, Village Runner, Village Runner Racing, and all of its sponsors, their affiliates, agents, servants, employees, volunteers, assigns successors, and heirs or distribution and all officials concerned for any acts, omissions, or negligence which may result in any bodily injury (including death) and/or property, loss of damage incurred by me arising out of or in connection with my and/or my dependent’s participation in this event. I warrant that I and/or my dependent are in good health and have trained sufficiently for this event. I willingly assume any risk inherent in entering this event. This waiver extends to all claims of any kind and nature whatsoever, whether known or unknown. Further, I grant permission to all of the foregoing to use any photographs, motion pictures, recordings, or any other record of this event for legitimate purposes.